How Can I Play Golf? Choosing the right club on each shot gives you the best chance of a successful result. 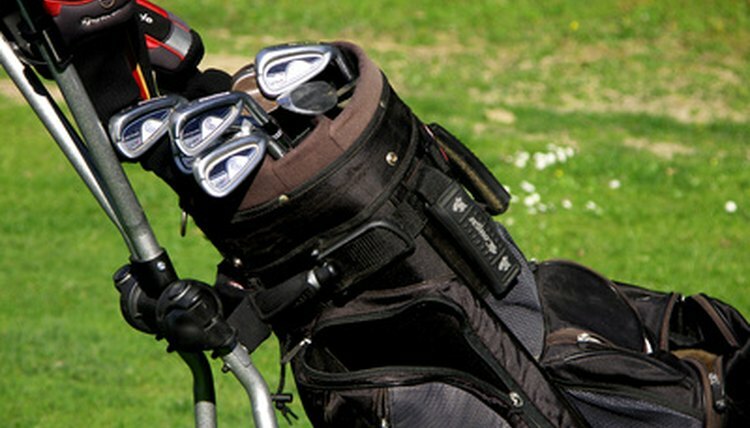 For a new player, a full golf bag, seemingly overflowing with clubs, can be an intimidating sight, and can leave the player unsure of what clubs to use at what time. While the situations on every course are dynamic, and have lead to innovations such as using woods to play chip shots around the green, the basics of club selection are enough to help a beginner get familiar with the game. Practice hitting balls at a driving range. A bucket of range balls can be purchased for much less than the average round of golf, and allows players to work on all of the phases of their game so they can play better on the course. Inquire at your local golf courses and driving ranges about the available golf pros and the pricing for personal lessons with those pros. A golf pro can analyze your swing by watching you hit on the range and offer tips and drills to improve weaknesses in your game. Play rounds off of the peak hours to get a discount on cost. Late afternoon rounds, known as twilight rounds, are offered at a discount as they do not ensure completion of a full round, with some courses offering increasingly lower costs over the course of multiple levels of twilight. For example, a course may cost $27, but offer $20 twilight rounds if you tee off after 4 PM, and $15 rounds for tee times after 5 PM. Midweek rates can also often be cheaper than playing a round on the weekend. Use a tee for the first shot on every hole of the course. The tee is an advantage granted only once a hole, and should not be passed up. Long holes, where you will be playing a driver or wood off the tee, require a high tee that holds the ball upwards of an inch over the ground. Holes that are shorter and will require an iron on the tee will require a lower tee, holding the ball just above the grass. Use irons or lower woods for mid-range shots when you cannot reach the green with your next shot. A great strategy to use is to attempt to hit the club which will put you at the ideal distance for the approach shot that you are best at hitting. Use a highly-lofted shot with a wedge to shoot at a pin that does not have a lot of room for you to roll the ball up to it. Wedges travel the shortest distance of all the clubs in a bag, but since they hit the ball very high with a lot of spin, they allow you to land the ball in a very small space without it rolling off the green. Use an iron for a chip shot, where the ball is placed back in the stance and hit low before bouncing toward the hole, to attack a pin with lots of green in front of it. Knock the ball out of a bunker by hitting the sand behind the ball with a wedge. With a bunker shot, it is important to take a firm swing, as the club will not be directly striking the ball, but will hit the sand just behind the ball, propelling it out of the bunker on a wave of sand. Focus on mastering your distance control with your putter so that, even if you don't accurately "read the putt," or deduce how the ball will roll left or right off its initial path due to the slope of the green, your putts will still finish near the hole. How Far Should a Pitching Wedge Shot Go? How Can I Improve My Golf Game?